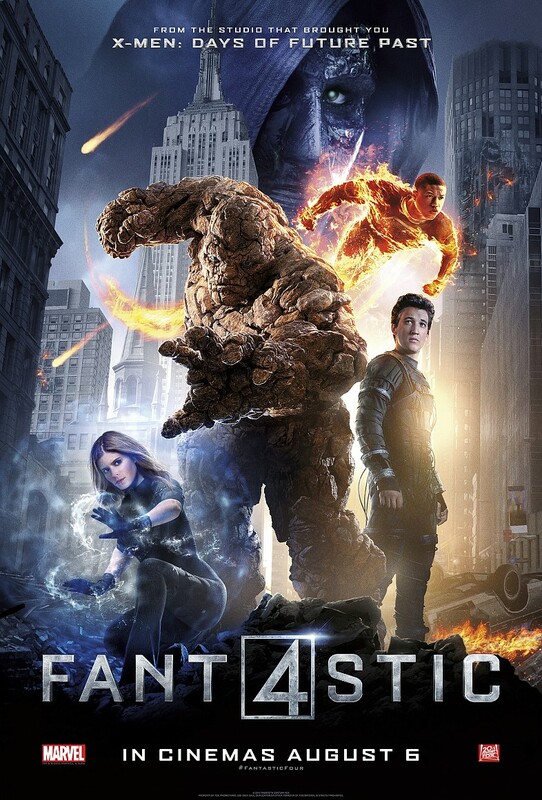 I initially never planned on seeing 20th Century Fox’s newest reboot of Fantastic Four. The trailers seemed somewhat interesting but mostly bland and generic. Much early speculation of the movie’s clouded, strangely secretive production theorized that the film might be a found-footage movie (director and co-writer Josh Trank had previously directed the well-received found-footage/superhero feature, Chronicle ), and no one seemed to know what was really going on with the movie until a couple last-minute trailers debuted, a rush of embargoed reviews finally released, and the movie at last opened on August 7th. And then the reception bombed worse than Hiroshima and Nagasaki. Over the past 10 days or so, Fant4stic has floated around a 7-10% on Rottentomatoes, has been almost universally panned by amateur internet reviewers, and grossed a weak $25.6 million in its opening week at the North American box office. The seething, hateful reaction this movie has prompted is just incredible. Many are claiming it to be the worst comic book movie since the likes of Catwoman (2004) and Batman & Robin (1997), and it will likely go down as one of the biggest box office bombs of the past 15 years. So, I decided to bite the bullet and check this film out in theatres, on my birthday no less, because little arouses one’s curiosity than a big dose of controversy. A couple semi-positive to positive defenses of the film from more level-headed reviewers gave me the final nudge to give this movie $7.50 and two hours of my time. I didn’t really have a problem with the film. Seriously, I didn’t mind it at all. I was expecting everything from a severely misunderstood genre piece to the complete trainwreck most have been yelling about, torches and pitchforks in hand. My immediate reaction after seeing it was pretty nonchalant and benign, and now after giving the film a week to mull over in my head, I’m still OK with the thing. So why do so many people, from critics to the fans to the internet as whole, hate this movie so damned much? A large part of me feels inclined to agree with Cecil from Goodbadflicks, who argues much of the backlash is due to the “internet hate-machine” and the inherent group-think/bandwagoning nature of mass audience-opinion. However, I agree with Mike Stoklasa and Jay Bauman of Red Letter Media more for pointing out that this movie, while far from the disaster most have been claiming it to be, has a style that will appeal to almost nobody; as a massive, $120 million superhero-movie tentpole blockbuster, that is a death sentence. The reason I liked most parts of Fant4stic is precisely because it doesn’t feel like a comic book-movie at all. I’ve long grown tired of the reigning Marvel Cinematic Universe formula of lighthearted, witty banter mixed with repetitive CGI-heavy action, and the fact that FF distances itself from this tone so much is why nobody is responding to it well. People want brief exposition, fun and likable heroes who save people, witty one-liners, and frequent, large-scale digital effects set-pieces. They liked the same thing they had last time. They would like more of that, please. Conversely, FF is a slow-burn science-fiction film with a David Cronenberg-tone in the vein of films like The Fly (1986) or Videodrome (1983). It spends most of the film building on the bizarre science elements of interdimensional travel, establishing the characters and their motivations, introducing their powers, and then caps it all off with a brief action-scene at the end. Now someone like me who loves true science-fiction (even if the “science” itself depicted in a particular movie is rather nonsensical) and weird, dark genre films will get a kick out of this, but few others will. Little kids will not take to this well by any means, and you can’t recommend this for fun, carefree, general entertainment for a weekend night out. How on earth Fox green-lit this project for a big-budget summer blockbuster and hired oddball Josh Trank is anyone’s guess. Which brings me to the next topic: This film’s he-said/she-said production history. Many claims from the studio accuse Trank of being difficult to work with on-set, that he trashed his living quarters, and was uncooperative in promoting the movie during its marketing campaign. Other sources indicate that the studio panicked after seeing earlier versions of the film and re-cut and re-shot much of the latter half of the version that is now in theatres. This latter point could definitely explain the film’s unfinished, unpolished feel, as well as Kate Mara’s reappearing and disappearing fake wig throughout the last 45 minutes of the story. As Mike Stocklasa said, this whole debacle isn’t necessarily Trank’s fault, but rather the studio’s fault for hiring him in the first place. Given Trank’s oddball filmography and the likelihood of earlier incarnations of FF being just as weird (if not more so) than the movie’s theatrical version, Fox has no one to blame but themselves. You hire an erratic, independent filmmaker to make a weird, body-horror sci-fi movie out of a superhero property that is unadaptable, you let him make his movie, and then you do a complete about-face at the last minute out of fear and recut the movie into what is essentially a rough-cut, unfinished project and release it theatres — you need to be prepared to accept the consequences. This is especially true when dealing with a production of this size, and a supposed mainstream superhero title at that. The dissonance between the Fantastic Four’s sci-fi concepts and wacky superpowers can exist just fine in the bizarre, psychedelic pages of a graphic novel, but to this date nobody seems to be able to make sense of a film-adaptation. For my part, the version we got in theatres is obviously unpolished and nothing special, but I liked a lot of it and appreciated the oddball feel of the whole affair. I took to the characters’ nerdy, grad-student personalities and loved the Scanners (1981)-type powers of Dr. Doom near the end. I’m a big fan of Cronenberg and swallowed Trank’s numerous homages to his filmography just fine. The only part of the movie I just flat-out did not like were the final 60-seconds of “witty” banter between the titular characters, an obvious lame attempt by Fox to “salvage” their film into a standard, lighthearted superhero-movie. Yes, much of the plot’s premise and sci-fi runs way past implausibility and then some, but I liked the tone, the characters, the David Cronenberg-esque body horror elements, and that the movie wasn’t another nonstop CGI action-fest with Tony Stark jokes. I, for one, actually appreciated that Trank stuck to just the origin story, rather than trying to fit two stories in one like Batman Begins (2005) or Man of Steel (2013). I understand why most general audiences and especially comic book fans expecting another Avengers (2012, 2015) have not taken to this well, but this isn’t another Batman & Robin, Battlefield Earth (2000), Catwoman, or what have you. It just isn’t. Chill out, people. SUMMARY & RECOMMENDATION: Fantastic Four is patient and dedicates most of its style to dark science-fiction, weird body-horror, and worthwhile exposition and character-establishment. If you judge this narrative on its own terms, and not what you believe you “deserve” based on mainstream comic book-movie formula, you’ll enjoy this movie for what it is: A quirky, big-budget nod to ’70’s era sci-fi and Cronenberg’s classic ’80’s style. Nothing more or less. — However… as it stands in its theatrical cut, the film comes across as indecisive at best and plain unfinished at worst. Some of the executive reshoots are painful. —> ON THE FENCE: It’s certainly not the disaster it’s been preached as, but it won’t appeal to most folks, and certainly not general audiences.
? So what is the secret of the ooze? And so once again studios meddle and shoot themselves in the foot. When are these people going to realise that creatives create and everyone else should stay away. As you say, if they don’t want a certain style for their film they should choose their director with a bit more diligence. Makes you wonder how Hollywod has lasted so long. They’ve lasted this long because, artistic interference or no, they’ve managed to appeal to the widest audiences possible and the lowest common denominator for as long as possible. Yes, the studio system has gone through numerous peaks and valleys throughout the years (remember the ’60’ and ’70’s and the American New Wave auteur era? ), but they always come out on top because they’re massive American corporations that maintain a monopoly on global film distribution. Moreover, sometimes studio interference is warranted and can be the voice of reason in the case of a megalomaniacal director — like George Lucas for example. Most of the time, though, the auteur gets screwed unfairly because MONEY.